Last week we had our new client, Robert (name changed) was taken onboard for Financial Planning Services. These are Robert's short term financial goals which he hopes to achieve in the next one year and is planning his finances accordingly. We at PersonalFN, guided to plan his short-term goals with liquid mutual funds. If like Robert you have short-term goals to fulfil then, read this guide on Liquid Funds to understand everything about investing in Liquid Mutual Funds. Chapter #1: What Are Liquid Funds? Chapter #2: Why Invest In Liquid Funds? Chapter #3: Who Should Invest In Liquid Funds? Chapter #4: When To Invest In Liquid Funds? Chapter #7: Liquidity Of Liquid Mutual Funds? Liquid funds are open-ended debt mutual funds that primarily invest in short-term money market instruments with maturity upto 90 days. Liquid mutual funds invest in money market instruments such as Certificate of Deposits (CDs), Commercial Papers, Term Deposits, Call Money, Treasury Bills and so on. Liquid Funds are highly liquid in nature and carry very low risk. How Do Liquid Funds Work? Similar to the way you make deposits at the bank, liquid funds invests your money. These funds invest in short-term debt instruments that mature in less than 13 months – that's the maximum. But on an average, they keep a maturity of less than 90 days. By keeping a short time-frame, these funds attempt to reduce risk. Though liquid funds are among the lowest-volatility types of investments, they are not entirely risk-free. Liquid funds—like all mutual funds—involve investment risk, including the possible loss of principal. Investors should be aware of the risks and potential for losses associated with liquid fund investing. Investing in liquid mutual funds usually entails less risk—and less reward—than investing in stock mutual funds. Similarly, bank deposits with a fixed interest rate entail a lower risk and less reward than do bond mutual funds. In the debt market, yields fluctuate and are not guaranteed. As the investments are market linked, the value of the investment can rise or fall. Bond prices are closely linked to interest rates. Interest rate risk defines the possibility of change in a bond's price due to a change in prevailing interest rates. Inversely proportionate, when interest rates go up, most bond prices go down. When interest rates go down, bond prices go up. In general, the longer remainder of a bond's maturity, the higher its duration will be; which leads to its price tending to fluctuate more as interest rates change. As liquid funds invest in low maturity debt investments and money market securities, the interest rate risk is negligible. Unlike typical bank fixed deposits or savings accounts, liquid mutual funds are not insured. Even though money market mutual funds invest in high-quality securities and seek to preserve the value of your investment, risk is inevitable. There is no guarantee that you will receive the invested capital when you redeem your units. If a bond issuer is unable to repay the principal or interest on time, the bond is said to be in default. A decline in an issuer's credit rating, or creditworthiness, will cause the prices of its bonds to decline and the NAV of the liquid fund, which holds the issuer's bonds, will decline as well. Just last year, Taurus Liquid Fund reported a 7.2% drop in its NAV on February 22, 2017. A decline of 7% in a day is uncommon in equity schemes. Taurus Liquid Fund had an exposure of 4.33% to securities of Ballarpur Industries Limited. The credit rating of the securities we downgraded to default status by India Ratings, leading to a massive decline in the value of the security. Because of the safety and short-term nature of the underlying investments, liquid fund returns tend to be lower than those of more volatile investments such as stock and bond. Thereby, creating the risk that the rate of return may not keep pace with inflation. Inflation risk is the danger that an increase in price levels will undermine the purchasing power of a bond's fixed interest payments. The longer a bond's maturity, the greater its inflation risk. Bond yields often incorporate expectations of inflation, so that investors are compensated for expected inflation risk. If inflation rises by more than expected when the bond was issued, investors will find that the interest and principal returned to them will be worth less than they had anticipated, hence, bond prices will fall, leading to a lower NAV of the mutual fund. As liquid funds invest in short-term investments, the inflation risk is low. Now that you understand a bit about liquid mutual funds, then let's find out why you should invest in a liquid mutual fund…. Please note, even debt investments are vulnerable to risk and hence should be managed carefully. They are not risk-free. Hence, professional fund managers are needed to mitigate these risks and yet generate positive returns. They understand the larger picture of economy well. They align and realign your debt portfolio according to the changing macro environment and dynamic interest rates. They can take a timely call, if they see any interest rate risk on their holdings, which, otherwise, may be difficult for an individual investor. Debt mutual funds enjoy some favourable tax treatment which in turn helps you increase your net returns. Your short-term capital gains from debt and liquid mutual funds is taxable as per your tax slab. Some securities, including Government securities, have a very high ticket size i.e. the minimum investment requirement is very high and hence are usually out of the reach of an individual retail investor. However, liquid mutual funds can pass on the benefit to you by investing in a multiple of such securities thus widening your choice of investment. Benefits of investing in liquid funds are galore, hence choose wisely to park your short term surpluses. Liquid funds are suitable for risk averse investors. In theory, longer the tenure of the paper, higher is the impact of change in the interest rate. 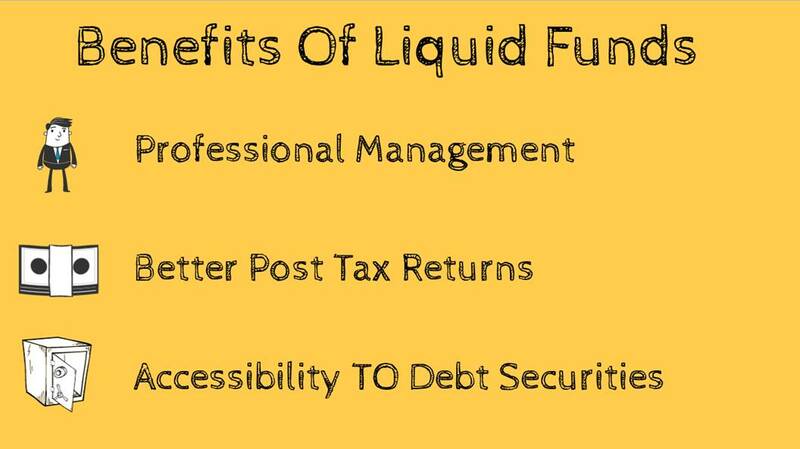 Liquid funds attract investors who want to park their money for a very short time period and seek safety of capital. It is suitable for investors who do not mind compromising on real rate of returns they would earn in the long run. Real rate of return is nothing, but inflation adjusted rate of return. Securities with lower tenure are less volatile as the interest rate movement is more predictable in the short run. Further, short term securities offer interest close to the prevailing interest rate for short tenure. If you are targeting some short-term goals, then you can park your idle money into liquid funds and earn better inflation-adjusted returns on them. Here, short-term refers to a period of less than one year. Short term goals can be like family vacation, pay-off personal/credit card loan, buy some furniture, and so on. For instance, you are planning for a family vacation at the end of the year, then you can start a monthly SIP (Systematic Investment Plan) and gradually build your vacation corpus. SIP in Liquid Funds is the smartest way to target for these short-term goals. Liquid funds are also ideal for parking short term surplus money. Since they have a lower maturity profile; they are less sensitive to credit default risk and interest rate risk. You can use liquid funds to park a portion of your contingency fund. These funds invest in money market instruments and are suitable even for a short-term investment horizon of less than 90 days. As most liquid funds do not have any exit load, you can exit any day, without any penalty. On withdrawal, the redemption proceeds are credited to your bank account within few hours (provided it's a working day). Liquid funds work great for investors looking for diversification of their entire portfolio. Normally, goals are categorised as long-term and short-term. But if you have a very short term of say 3 months, then Liquid funds are best bet to park your short term liquid funds. For many investors, liquid funds prove to be beneficial as they generate better returns as compared to bank savings account. Again, Liquid funds are suitable for investors who need money in immediate future, but at the same time would mind to invest for the short term period. Further, the quick redemption policy makes it even more favourable. Before investing in a liquid mutual fund, it is vital to understand impact of changing interest rates. Interest rates and bond prices share an inverse relationship. So, when interest rates in the economy move upwards, prices of bonds issued at the rate lower than the new rate go down and vice versa. For example: A fund manager bought a bond issued at its face value of Rs 100 which pays interest at 9% p.a. for 5 years. Now, if the rate of interest for a fresh series of bonds with the similar maturity and risk profile earns 9.25% due to a rise in the interest rate, then the bond which the fund manager holds will lose its value and now will trade at a price below its face value i.e. below Rs 100. This is known as interest rate risk. In rising interest rate scenario, financial system might face a short term liquidity crunch due to monetary tightening measures. Under such circumstances, liquid funds performance remains unaffected. Hence, they prove to be a better investment option to park your short term surplus funds. On the other hand, in falling interest scenarios there is liquidity pressure in the system and hence liquid and liquid plus scheme start losing their sheen. But we at PersonalFN believe in ‘time in the market’ over ‘timing the market’. In other words, irrespective of the market scenarios, liquid funds work well to serve your short term goals and needs. Traditionally, Bank FDs have been staple instrument to park one's savings for very long. But slowly this behavior is changing too. 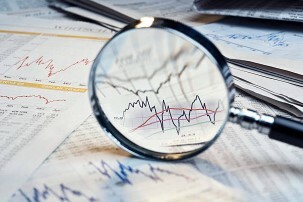 Many investors are exploring various investment avenues looking for better returns. A comparison is being made between bank FDs vs. mutual funds — although this is alike to comparing apples with oranges. It is vital to recognise that investing in mutual fund schemes commands a higher risk vis-à-vis bank FDs (and small saving schemes). While the interest rate offered on bank FDs are pre-specified and fixed for the entire tenure, the returns on mutual funds may vary based on the market movement. Given the market-linked nature of liquid funds, the return potential hinges on market conditions and how efficiently the fund manager manages the portfolio. Usually, mutual fund schemes outscore during positive market conditions, and underscore bank FDs during negative market conditions. So, you should consider your risk appetite while opting between bank's fixed deposits and mutual funds. Mutual funds unlike, bank FDs do not come with insurance and credit guarantee. DICGC provides guarantees an amount of up to Rs 1,00,000 per depositor per bank - for both principal and interest. Over the long-term, liquid mutual funds, carry potential to generate inflation-adjusted returns. Also known as real rate of return. But a lot depends on selecting the best funds. Liquid Funds have high liquidity. Whereas, in case of bank FD liquidity is bound by the tenure of the FD. The option to prematurely withdraw a bank FD is of course available; but you would lose out a portion of your expected return, and a penalty is charged. Thus, bank FDs offer medium-to-low liquidity. In case of liquid mutual funds expense ratio may be upto 1% p.a. The expense ratio has a bearing on returns, as the return yields are post-expenses. On the other hand, bank fixed deposits offer an advantage on this parameter, as they do not levy any expense on the depositor. And you get the entire rate of interest promised by the bank. With pre-mature closure of bank FDs you may have to pay some charges. But in case of liquid funds, there is no exit load. So liquid funds are cost efficient when compared to bank deposits. This is an important aspect while choosing between mutual funds and fixed deposits. Your gains from long term investment in debt mutual funds (i.e. over a period of 1 year) is taxable @ 20% with indexation and 10% without indexation (whichever is lower); while your short-term capital gain from debt and liquid mutual funds is taxable as per your tax slab. In case of bank FDs, the interest is taxable as per your tax slab (i.e. as per marginal rate of taxation) irrespective of the tenure of the bank FD. Thus comparatively, investing in liquid mutual funds is more tax efficient than bank FDs. As mentioned earlier, being less sensitive to the interest rate fluctuation, Bank FDs become attractive avenue for risk averse investors. Let’s now quickly check the advantages and disadvantages of both the categories of investments. 1. How long I don't need funds that are lying in my bank account? 2. What is my income tax slab? 3. What is my risk appetite? 4. Do I need to take an expert opinion on the prevailing interest rate cycle or am I well equipped to do the macro analysis on my own? If you are mentally avoiding liquid funds for Savings Bank Account then you should read this chapter. Liquid funds as you know are open-ended debt mutual funds. So let us understand its comparison between arbitrage funds and savings account. Arbitrage means simultaneously buying and selling of securities, currency, or commodities in different markets at same time. For example, equities can be traded in cash as well as derivatives market. In the 'cash market' investors buy / sell securities at price for delivery and settlement of the trade. On the other hand, in the 'derivatives market', especially in 'futures', a contract is entered to buy/sell security at some future date with no immediate delivery of the security. On several occasions, the same asset is traded at different prices in different segments and/or different markets, which results in an arbitrage. This arbitrage opportunity has given birth to arbitrage funds, wherein the fund manager tries to capitalize on such opportunities by exploiting the price differentials. They take opposite positions in different markets / different segments depending on opportunities in order to clock returns. They rarely result in a loss, but mind you, a possibility of a loss cannot be ruled out. Well, this is an age-old and easiest way to park short-term needs, and even keep aside some money to manage contingencies. But if you wish to battle inflation while managing your short-term liquidity, you can't be parking too much surplus in a saving bank account. It will prove to be imprudent. A prudent comparative assessment of various short-term investment avenues is necessary to park short-term liquidity prudently. Thus far, both, arbitrage and liquid funds have generated superior returns compared to the interest earned on a savings bank account which is around 4% -- 6% p.a. Though the Reserve Bank of India (RBI) de-regulated bank rates in 2011, very few banks offer interest @ 6% p.a. Moreover, from a tax perspective since arbitrage funds are treated as equity oriented. Even though the long term capital gains tax will now be 10% (for units held for more than 12 months) and DDT of 10% equity mutual funds are more favourable. Also, the short term capital gains are taxed at 15% (for units held for a period of less than 12 months). So, they offer liquidity plus are capable of generating tax-efficient returns by managing the high volatility of the market. While, liquid funds too are a good option to park your idle cash and relatively less risky; the debt-oriented classification puts them in a disadvantageous position. The Long Term Capital Gains (LTCG) tax (for units held for more than 36 months) @ 20% with indexation benefit is restraining. Additionally, if opted for the dividend option, the dividend declared by liquid funds carry effectively 28.84% Dividend Distribution Tax (including surcharge and cess). In case of savings bank account, the interest is not subject to Tax Deduction at Source (TDS). But the interest over a sum of Rs 10,000 is taxable as per the provisions of section 80TTA of the Income-tax Act, 1961. Thus, if you keep excess liquidity in a savings bank account and fall in the highest tax bracket of 30%, you could be at a disadvantage. Therefore, before parking your savings in any of these avenues assess your immediate liquidity needs. Then prudently allocate the investible surplus to a savings bank account, liquid fund, and arbitrage fund gauging your risk appetite. This will help you generate optimum returns while addressing short-term liquidity needs. If you let your surplus liquidity lie in a savings bank account, you will lose out on the opportunity to clock potential returns. Gone are the days when you had to bear a 20-minute hold to book a cab. Now through app-based taxi operators, you can book a cab almost instantly. Even in the mutual fund industry, processes that took hours or days, today takes just few minutes. Fund houses now offer instant withdrawals under their liquid schemes. With this facility, it takes under 30 minutes to transfer the redemption amount to your bank account. Hence, Liquid Funds again become a favourable option to park your short-term funds. *Standard Deviation indicates Total Risk and Sharpe Ratio measures the Risk-Adjusted Return. They are calculated over 1-Yr period assuming a risk-free rate of 6.1% p.a..
As seen in the table, some schemes have been able to perform well with low volatility. Hence, when selecting a fund, always pay heed to the risk-adjusted returns. How to pick the best liquid fund for 2018? PersonalFN believes, when you invest in debt funds, you should be careful about the safety measures undertaken by the fund. Unfortunately, most investors overlook the risk. To reiterate, liquid funds are not risk free. You should ideally keep away from the funds that invest in debt securities of inferior quality. You should not invest in a liquid scheme solely based on past returns, as certain schemes may have achieved higher returns by taking additional risk. The average maturity of the debt mutual fund scheme should be low at around 30-90 days, so that it is less vulnerable to interest rate movements. The interest rate sensitivity of a bond is measured vide its modified duration. Modified duration measures the sensitivity spectrum of the bond price is in relation to change in interest rates. It is a vital measure for you to consider because it includes all components of a bond: price, coupon, maturity date, and interest rate to calculate modified duration. Therefore, modified duration can help you recognise that a bond portfolio with high modified duration will have high price volatility. Thus, liquid funds with a lower duration will be lower risk. YTM is nothing but an anticipated rate of return if the bond is held until maturity date. It is also known as redemption yield. It measures the interest income generated by the bonds in the portfolio. YTM takes into account: the current market price, the face value, the interest payment that will fall due on the bond and years left in its maturity. YTM can be used as an approximate measure of the returns that a fund can generate over its average maturity period. As you may know, debt instruments in India are rated on the basis of their credit worthiness by various credit rating agencies such as CRISIL, CARE, ICRA, amongst others. Bond and debentures carry a credit rating like AAA, AA, and so on. Each rating denotes certain degree of risk involved — for example, AAA rating is the highest credit rating on this chart. Hence, credit ratings for debt instruments in the portfolio of a debt mutual fund scheme can throw some light on the qualitative aspects as it helps you assess the credit risk. If the portfolio consists of securities with highest credit rating, it implies that the portfolio is less exposed to default risk. With the rise in the number of downgrades, it is very important to check how risk-averse the fund manager is and whether your risk appetite is in line with the fund, you plan to invest in. PersonalFN believes, when you invest in debt funds, top priority should be given to the risk management measures. Along with risks the investment processes and systems followed by the fund house plays a crucial role. Then, carefully read the investment strategy the fund would adopt to build its portfolio to achieve its investment objectives. If the scheme's investment objective will not address the financial goal(s) you have envisioned, clearly stay away. This will help you have only the appropriate schemes in your portfolio. Do not invest in a liquid funds solely based on their past returns. Pay attention to the quality of debt securities held by the scheme. PersonalFN is of the view that while selecting any fund for your portfolio you should concentrate on the risk-reward matrix. Gauge your risk profile and investment horizon, and then make smart moves. If you’re averse to risk and have a short-term investment horizon of 3 to 6 months, consider investing in ultra-short term funds (also known as liquid plus funds). And if you have an extreme short-term time horizon (of less than 3 months) you would be better-off investing in liquid funds. Don't forget that investing in debt funds is not risk-free. However, money market mutual funds are a good investment option to park your short term surpluses. Consistency in performance across time frames must also be observed while investing in any liquid fund. Also, liquid funds generating poor returns yet charging high expense ratios should be avoided. If you If you need research backed recommendations to select best debt mutual fund schemes for you portfolio, opt for PersonalFN's FundSelect research reports. And it is easy to Subscribe to FundSelect. You can also download our Free Debt Mutual Fund Guide here. You can store this for your future reference. Hope this guide was a meaningful read for you. Do leave a commment and we will be happy to hear from you. Also, do not forget to share this guide with your loved ones.